Amazing night shots by Tech. Sgt. 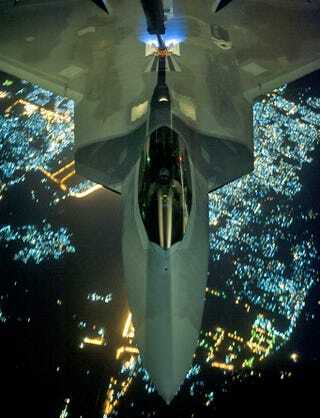 Russ Scalf: An F-22 Raptor refuels over the Arabian Peninsula en route to Syria, armed and ready to attack ISIS targets. Look at the pilot inside, with his night vision helmet. It's so cool it doesn't even seem real. As you probably know, the F-22 Raptor stopped being the coolest and most expensive flying toy in the history of the Air Force when the United States and its allies decided to obliterate the gang of psychopaths known as ISIS (self-proclaimed "Islamic State in Iraq and Syria") from face of the Earth. After almost a decade of flying around in circles firing missiles at fake targets, it made its maiden combat flight a few days ago.